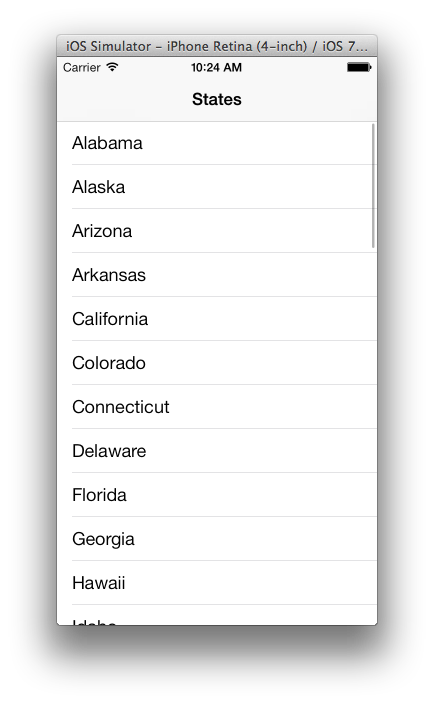 ProMotion::TableScreen allows you to easily create lists or "tables" as iOS calls them. It's a subclass of UITableViewController and has all the goodness of PM::Screen with some additional magic to make the tables work beautifully. searchable placeholder: "Search tasks", no_results: "Sorry, Try Again!" Method that is called to get the table's cell data and build the table. It consists of an array of cell sections, each of which contain an array of cells. View the Reference: All available table_data options for an example with all available options. TableScreen supports the :switch accessory and custom accessory views. Causes the table data to be refreshed, such as when a remote data source has been downloaded and processed. # Returns an array of the first letter of the title of each section. Called when a cell is created (not dequeued). data is the cell hash you provided in the table_data method. It's recommended that you call super if you override this method. Called when a cell is dequeued and re-used. data is the cell hash you provided in the table_data method. Fires right before a cell is displayed in a table. Use this method to do additional setup on the cell, or other operations such as infinite scroll. If you specify editing_style: :delete in your cell, you can swipe to reveal a delete button on that cell. When you tap the button, the cell will be removed in an animated fashion and the cell will be removed from its respective table_data section. If you need a callback for every cell that's deleted, you can implement the on_cell_deleted(cell) method, where cell is the attributes form the original cell data object. Returning false will cancel the delete action. Anything else will allow it to proceed. You can call delete_row(indexpath, animation) to delete. Both the UI and the internal data hash are updated when you do this. # Return a UIView subclass here and it will be set at the top of the table. This is useful for information that needs to only be at the very top of a table. 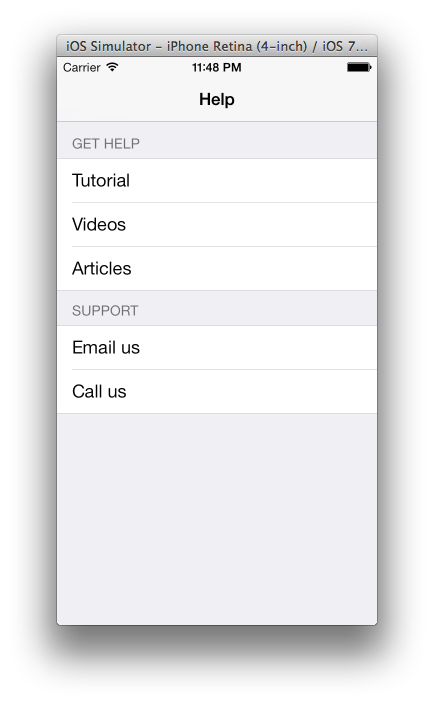 You can customize the section header views just before they are displayed on the table. This is different from table header view, which is above. # Return a UIView subclass here and it will be set at the bottom of the table. This is useful for information that needs to only be at the very bottom of a table. Class method to make the current table searchable. searchable placeholder: "Search This Table"
Specifying no_results: will change the text that is displayed when there are no results found. searchable placeholder: "Search This Table", no_results: "BZZZZZ! Try Again!" To initially hide the search bar behind the nav bar until the user scrolls it into view, use hide_initially. You can supply additional textual data that you want to be searchable but not display anywhere on the cell by setting the cell attribute search_text to a string. Cells with search_text will display in search results if the search term matches either the title or the search_text attributes. search_text: "and will match these words too!" If you need to know if the current table screen is being searched, searching? will return true if the user has entered into the search bar (even if there is no search results yet). To get the text that a user has entered into the search bar, you can call search_string for what the data was actually searched against and original_search_string to get the actual text the user entered. These methods will return back a String or a falsey object (nil or false). puts "the user tapped the search bar!" puts "the user tapped the 'cancel' button!" Class method to set the row height for each UITableViewCell. 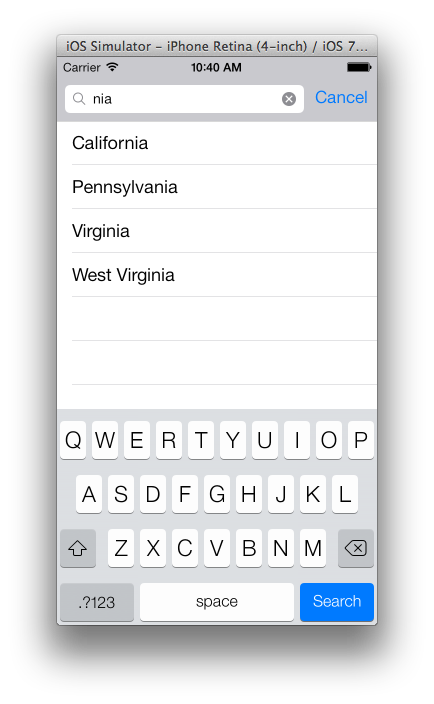 You can use iOS 8's 'automatic' row height feature by passing :auto as the first argument. Class method to make the current table have pull-to-refresh. All parameters are optional. If you do not specify a callback, it will assume you've implemented an on_refresh method in your tableview. If you initiate a refresh event manually by calling start_refreshing, the table view will automatically scroll down to reveal the spinner at the top of the table. This simply takes the first letter of each of your section titles and uses those for the "jumplist" on the right side of your table screen. This will allow you to specify an additional "long_press_action" on your table cells. You get all the normal accessors of PM::Screen, but no documented TableScreen accessors are available. You can specify cells to be moveable in each individual cell hash. If you want the cells to only be moveable within their own section, define moveable: :section in each cell hash. When you want the user to see the moveable drag handles, call toggle_edit_mode or edit_mode(enabled:true).